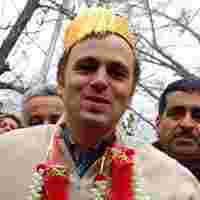 National Conference president Omar Abdullah, whose name has been proposed by his father and party patriarch Farooq Abdullah for the post of Jammu and Kashmir chief minister, said it presented an opportunity for him to rebuild the state and restore peace of the pre-1989 era. What transpired overnight that your father Farooq Abdullah decided to name you as chief minister this morning? This morning, I received a call from him that I should have breakfast with him at his place. There, he told me that he had decided that I should be the CM. I tried to convince him otherwise, but he said that it was important that I become the CM and he would like to work in the state for the party and would like to play (a) role at the national...and international level. Is Farooq Abdullah going to the Rajya Sabha? What is the difference between 2002 and 2008, with your party having the same number of seats (28)? It is a complicated scenario. In 2002, it was an anti-incumbency vote. This time, it is a positive vote. Despite all attempts by Mufti Mohammad Sayeed to wipe out the National Conference during his rule, by adopting a populist agenda in which the PDP (People’s Democratic Party) tried to take credit for everything, including the opening of the Srinagar-Muzaffarabad road, the National Conference emerged as the single largest party. I am surprised that PDP president Mehbooba Mufti tried to take credit for the large turnout of voters. This time, it is a credit to our resilience. What are your tasks ahead? First thing first, we will have to deliver good governance. Apart from addressing the issues of sadak, bijli, paani, we will have to address the larger political issues... But it’s premature to get into specifics at this point of time. Separatism is not dead. Separatists are relevant. They are perhaps at their lowest point ever since the secessionist movement began in 1989. Now, their relevance would depend as to what role...they play. They should realize that the people are fed up with their repeated calls for strikes and hartals. What kind of coalition do you hope to have with the Congress? I think it is only these two parties—the NC and the Congress—that do not believe in playing region against region, community against community. We both believe in building bridges between the regions and communities. Our task is to build bridges of relationship and trust. It is not necessary that if something went wrong in the past...(it) would be repeated again. There is a generational shift. I am hoping to work with the likes of Rahul Gandhi... My father had worked with Indiraji and Rajivji and my grandfather with Pandit Nehru. We got to (have) our channels of communication open. That would work. What is the ideal Jammu and Kashmir for you? Peace and brotherhood of the pre-1989 days and progress and development of Kerala and Gujarat in the 21st century. This is not an easy task, but it is a golden opportunity for us to deliver. This government would be representative of all regions, people of all age groups. Did Mehbooba Mufti congratulate you? Yes, on a TV channel. Not the way I did when I visited their place in 2002.